At TMB Makeup Artistry, LLC, we specialize in beautiful professional makeup application for both men, women and teenagers. We have experience applying makeup for many different occasions such as weddings, bar mitzvahs, proms, and even just for our clients who would like it done for their day to day life. For those occasions where you don’t feel comfortable applying your own makeup, professional makeup application is a great option. Your bridal makeup should embody the theme and vision of your wedding experience, as well as capture your style and personality. TMB Makeup Artistry is dedicated to uncovering each bride’s unique look that will encompass your theme, vision, style and personality! Our goal as a bridal vendor is to use our expertise and experience to give you a timeless look that not only makes you look gorgeous, but to feel just as amazing! We offer three bridal packages that will fit the needs of any bride’s budget while maintaining the pampered elegance of this luxury experience! Each package includes a consultation, trial makeup application, skin preparation, wedding day makeup, bridesmaids / bridal party services and makeup touch ups with kits. Click the Bridal Packages Pricing link to access additional information about each level of service. All services included in each package are explained below. Consultation - Your consultation is designed to gather as much information about the look of your wedding experience, your style and personality. We will discuss the look you want for your special day by utilizing pictures to pinpoint your desired look. Other special considerations such as, covering tattoos, skin sensitivities, allergies, vegan or cruelty free preferences will also be discussed. Trial Makeup - We execute the desired look developed from the consultation. This service is a full makeup application that includes, but not limited to, full skin care and prep, foundation and base, eye shadow, blushe, lips and lashes. Basic Level Skin Prep - Skin is gently prepped to remove excess oils, then we apply moisturizer that will work with your skin needs. Finally, skin is given a third layer of a primer suitable for skin needs. Mid Level Skin Prep - Skin is double prepped to remove excess oils, we apply a moisturizer that will work with your skin needs, then further prepped the skin with a moisture mask. The final layer of skin prep includes a primer or an additional layer of moisture depending on skin needs. Premium Skin Prep - Skin is double prepped to remove excess oils, we apply multiple layers of moisturizer that will work with your skin needs to hydrate, plump the skin, and make it smooth for applying foundation. Moisture masks and Hyaluronic Acid serum are included in this preparation. The final layer of skin prep includes a primer or an additional layer of moisture depending on skin needs. Wedding Day Makeup - The makeup service for the bride and bridal party on wedding day. 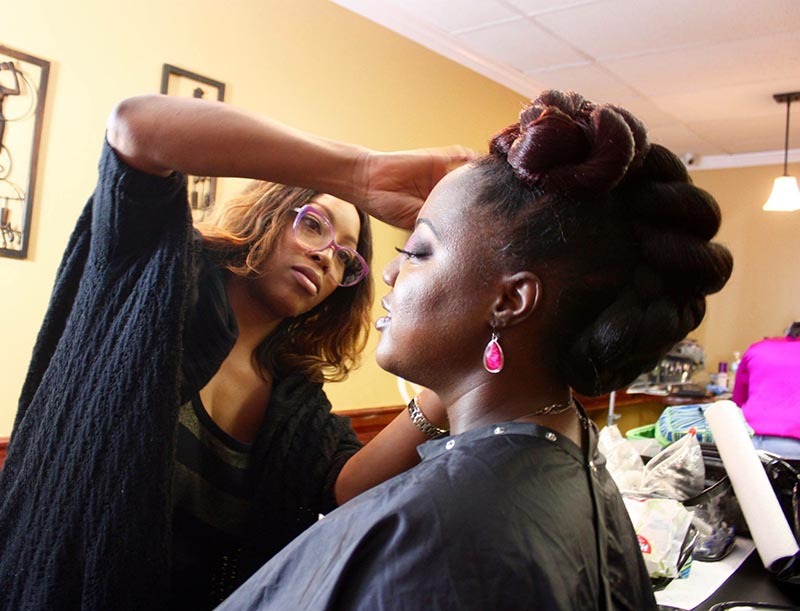 The bride receives the look created at the consultation and trial and the members of the bridal party (mother of the bride, bridesmaids, junior bridesmaids, Maid / Matron of Honor) receive makeup services. Bridesmaids Services - The makeup services for the members of the bridal party. Services include skin care and preparation, foundation, blush, eyeshadow, lashes, lip color and touch up kit. For the gold and platinum packages, up to 3 additional members of the bridal party are eligible for the package skin preparation. Bridal parties larger than 3 members will receive the basic level skin prep with the corresponding rate of $70 per person. Makeup Touch Up Services - For larger bridal parties, clients that received makeup services first will get the lip color touched up and any other skin touch ups as needed after the bride receives her makeup service. All members of the bridal party are given a touch up kit that includes lip color, applicator, sponge, and tissues. Group Makeup Classes “Get Flirty in Thirty” is hands on class where Makeup Artist, Lisa Rose, will show you how to apply the basic, makeup essentials to give you a flawless and well-polished look. The class focuses on skincare, foundation, eyes, blush, and lips. Once you’ve mastered the steps and technique, you will be able to complete this look in 30 minutes, anytime! No more than 10 participants. 2.5 - 5 hours Must have 5 people to book. $50/ea. Booking Fee is a deposit required to guarantee services on the event day, must be paid before the event service and is applied to the total balance. This fee only applies to all services. Please see Terms and Conditions. Non-Refundable or Transferable. $35 and up. 35% for parties 4+ .